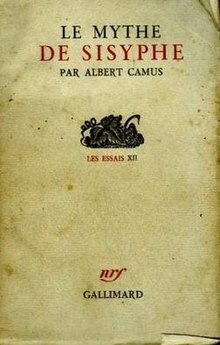 In the essay Camus introduces his philosophy of the absurd, man's futile search for meaning, unity, and clarity in the face of an unintelligible world devoid of God and eternal truths or values. Does the realization of the absurd require suicide? Camus answers, "No. It requires revolt." He then outlines several approaches to the absurd life. 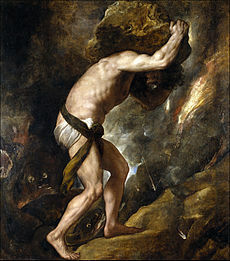 The final chapter compares the absurdity of man's life with the situation of Sisyphus, a figure of Greek mythology who was condemned to repeat forever the same meaningless task of pushing a boulder up a mountain, only to see it roll down again. The essay concludes, "The struggle itself ... is enough to fill a man's heart. One must imagine Sisyphus happy". He begins by describing the absurd condition: we build our life on the hope for tomorrow, yet tomorrow brings us closer to death and is the ultimate enemy; people live their lives as if they were not aware of the certainty of death. Once stripped of its common romanticism, the world is a foreign, strange and inhuman place; true knowledge is impossible and rationality and science cannot explain the world: their stories ultimately end in meaningless abstractions, in metaphors. This is the absurd condition and "from the moment absurdity is recognized, it becomes a passion, the most harrowing of all." It is not the world that is absurd, nor human thought: the absurd arises when the human need to understand meets the unreasonableness of the world, when the "appetite for the absolute and for unity" meets "the impossibility of reducing this world to a rational and reasonable principle." For Camus, who set out to take the absurd seriously and follow it to its final conclusions, these "leaps" cannot convince. Taking the absurd seriously means acknowledging the contradiction between the desire of human reason and the unreasonable world. Suicide, then, also must be rejected: without man, the absurd cannot exist. The contradiction must be lived; reason and its limits must be acknowledged, without false hope. However, the absurd can never be permanently accepted: it requires constant confrontation, constant revolt. How should the absurd man live? Clearly, no ethical rules apply, as they are all based on higher powers or on justification. "Integrity has no need of rules. 'Everything is permitted' is not an outburst of relief or of joy, but rather a bitter acknowledgment of a fact." The next example is the actor, who depicts ephemeral lives for ephemeral fame. "He demonstrates to what degree appearing creates being. In those three hours he travels the whole course of the dead-end path that the man in the audience takes a lifetime to cover." He then analyzes the work of Dostoevsky in this light, especially The Diary of a Writer, The Possessed and The Brothers Karamazov. All these works start from the absurd position, and the first two explore the theme of philosophical suicide. However, both The Diary and his last novel, The Brothers Karamazov, ultimately find a path to hope and faith and thus fail as truly absurd creations. In the last chapter, Camus outlines the legend of Sisyphus who defied the gods and put Death in chains so that no human needed to die. When Death was eventually liberated and it came time for Sisyphus himself to die, he concocted a deceit which let him escape from the underworld. After finally capturing Sisyphus, the gods decided that his punishment would last for all eternity. He would have to push a rock up a mountain; upon reaching the top, the rock would roll down again, leaving Sisyphus to start over. Camus sees Sisyphus as the absurd hero who lives life to the fullest, hates death, and is condemned to a meaningless task.